Crystal and glass are beautiful when painted right. For some of us it just doesn't "click" and we tend to over paint. One of the draw backs of being a self taught artist, some times you just can't figure it out. For me that is difficult to admit, so I avoided anything with crystal and glass. After some coaxing and the opportunity to view a set of videos made by Mollie Jones during a gathering of Painting Friends , I decided to make the attempt. This would also give me the opportunity to learn to loosen up a little and still achieve detail. The painting demo is of a beautiful crystal bowl, with strawberries....now I am doing glass and reds. 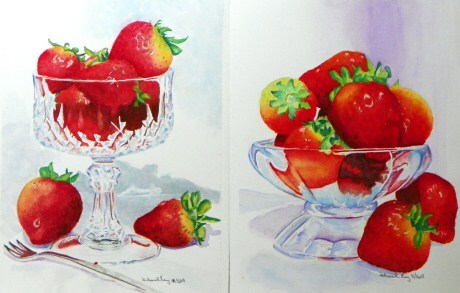 I started with the strawberries. At this point I was more afraid of the amount of red paint then I was about creating detail in the crystal. But once the brushes were wet and the paint was on the paper, the fears were aside. Now I was more interested in technique. How much did I remember? When the painting was finish, and it actually looked like crystal, I was surprised at how much I enjoyed painting crystal and how much I had learned. I also wanted to paint another one. I pulled out some of my "crystal", bought some strawberries, created and photographed several setups, and chose my favorites. I painted 2 more, and have plans for another in the near future. Now whenever I see interesting piece of crystal or cut glass, I now find myself thinking of what I could put in it or with it to photograph and paint.!! You're right Mollie, I'm hooked!!! Hey Deb...sorry to be some long in getting in here. You did fabulously on this crystal! I love it! 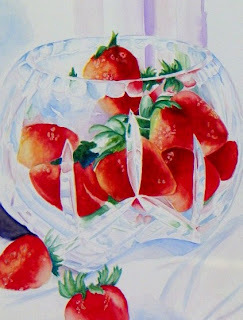 See what you can do when you really look at glass...and you're right...you'll get totally addicted to painting glass. Love your reds in all three compositions.